When you’re in your 20s, you feel invincible. As we age and start building a family, we may still feel invincible, but having loved ones who depend on us now makes us start to ask ourselves questions about the what ifs in life and what would happen to our loved ones if we weren’t around to provide. Will they be able to pay the bills? Will Sally and Timmy be able to go to college? We hate to talk about dying prematurely, but let’s face it, we are all going to die at some point and it is always harder for those left behind than it is for you to deal with. Something as simple as a having life insurance can make things much easier for them to recover if the unexpected does happen. The whole point of life insurance is to help your loved ones that depend on you financially continue their lifestyle if you couldn’t be there to provide. So, now that you’ve determined that you need life insurance, when is the right age to buy it? If you have people who do depend on you financially, like a spouse, children or elderly parents, then you need life insurance. There’s no perfect age to buy life insurance; the perfect age is the age in which your loved ones start depending on you. When you get married your spouse depends on you and you on them, that is the time to get life insurance. When you have children that depend on you, that is the time to get life insurance. When you become responsible for the care of an aging relative, such as a parent, that is the time to get life insurance. More and more adult children are caring for their parents and life insurance is a great way to ensure that they continue to get the care they need, even if you’re not around to help pay for things. There’s no perfect age to buy life insurance; the perfect age is the age in which your loved ones start depending on you. Another consideration is pre-planning and buying life insurance even before you have financial dependents. This is very beneficial from a price standpoint. The younger you are the cheaper life insurance is because your likelihood of dying is much lower. A policy for someone in their 20s is upwards of 10 to 20 times less expensive than for someone buying in their 50s, simply because of the risk of dying is lower and overall health is better at a young age. The policy can stay in place for up to 30 years and at any time you can update or change the recipient of the money from the policy when you get married or have children. Buying life insurance when you’re young can be a great family planning tool for those who like to think ahead. Now, if you’ve determined that you’re at the perfect age for life insurance you probably just said to yourself that buying life insurance sounds like the most un-interesting thing a person could do. Well, good news, there is finally a place where you can research, compare and purchase life insurance from the comfort of your own home and in a way you can understand no matter what your “perfect age” is. 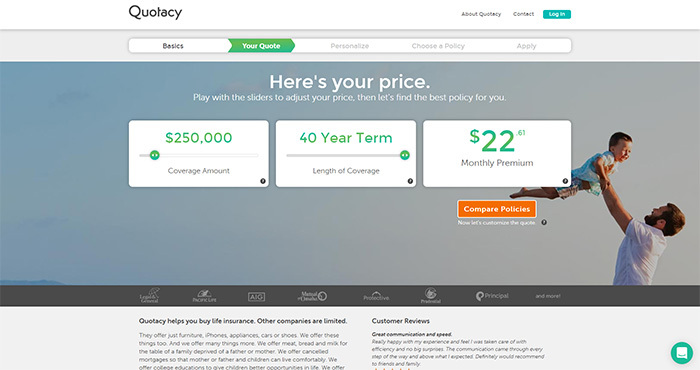 At Quotacy.com, you can learn everything you need to know about anything to do with life insurance in a fun, friendly, and understandable way with the option to buy online with no pressure. So, if you’re at the perfect age to buy life insurance, see how little it would cost you to protect your loved ones with life insurance by running free and anonymous term life insurance quotes. It’s never too soon to buy life insurance, it’s only too late. There is no perfect age to buy life insurance. The perfect age is the age in which you have loved ones who start depending on you. When you get married and your spouse depends on you and you on them, that is the age to buy life insurance. When you have children that depend on you, that is the age to buy life insurance. When you become responsible for the care of an aging relative such as a parent, that is the age to buy life insurance. When you start a business, that is the age to buy life insurance. No one enjoys talking about the fact that we may die unexpectedly before the ripe old age of 80. We’re all going to die at some point and it’s always harder for those left behind than it is for the person who dies. Something as simple as having life insurance can make things much easier for your loved ones if the unexpected does happen. Nothing of course can replace you but the death benefit from a life insurance policy can financially help while your family recovers emotionally. Bills still need to be paid and without your income this would be a struggle without life insurance. Your age and health are the the two biggest factors that affect your life insurance costs. The older you are, the higher your premiums. The more health issues you have, the higher your premiums. Because of these two factors, it’s best to buy life insurance as soon as the need arises. Term life insurance is really quite inexpensive especially if you purchase it before any serious medical issues kick in. And if you buy a term life insurance policy before age 45 you also have the option to get a policy that will last 40 years. The quote shown is for a healthy 30-year-old woman. For under $30 per month she can have $250,000 of life insurance coverage until she’s 75 years old. If she were to die anytime before age 75, her family would receive $250,000. This can help pay for a funeral, pay off a mortgage, pay for college tuition, the family can use this money however they wish. Whether you’re 25 or 75, we can help you get life insurance. Start by running free term quotes on the Quotacy website. Unlike most online life insurance websites, we don’t require any contact information from you to provide a quote. Window-shop in peace without getting flooded with sales calls. And remember: the main reason for life insurance is not for you, it’s for the ones you leave behind. 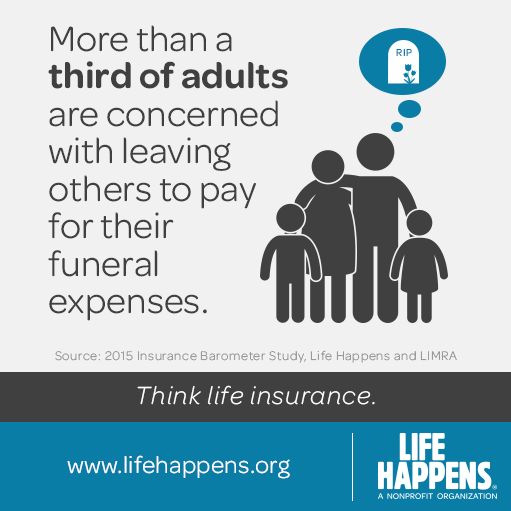 If you have any questions about life insurance make sure to leave us a comment. Otherwise, tune in next week when we talk about buying life insurance if you have sleep apnea. Bye!